We hope, that you come next year. Two big WL skiers celebrated his first race. 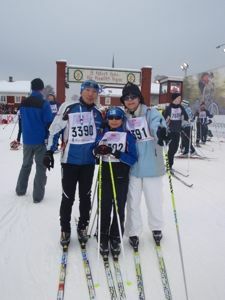 In 2010 he was 10 years old, this year his race was Finlandia-hiihito 32 km CT with mother and 20 km FT by himself in Finland. Under the warm temperature and soft snow condition many skiers struggle with skiing & waxing, it took long time to finish the race. But he had enough power not to say mother please wait for me, he told to mother are you fine? I am waiting for you. He got 2nd stamp in Lahti on Saturday. On Sunday he skied again by himself for 20km skating race. 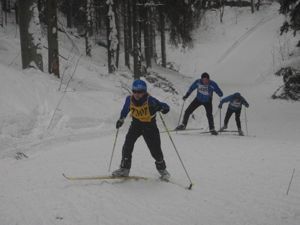 Finlandia-Junior 20km FT race is the best gateway to the WL for young skiers. After the Finlandia we moved to Poland, Bieg Piastow, snow condition was perfect he enjoyed 26kmCT race, last 3km he sprinted with Polish boy. He saw many famous WL skiers at the reception. 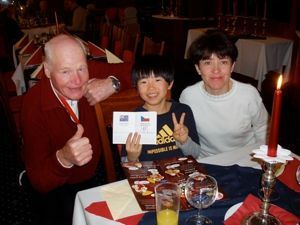 He had wonderful ski life and got 3rd stamp in Poland. In 2011 this winter is family ski year for him, we visited Estonia and Sweden. In Estonia it was so cold condition -25C, then children’s race was canceled. But our family started on Sunday’s race. Father started long race in the morning then at the connection point waited for family for the short race. It was so difficult to wait on the snow about 40 minutes, too cold. Then we are three skiers started for the finish, it took so long time, last 3 km it was getting dark and colder, we rested last food station sat near the fire and took coffee and snack, we stayed there 15mintes then started again for the finish line. His 31km race finish time was only 11 minutes before the time limit, congratulation for his 4th stamp under so severe cold condition. We moved to Mora, he entry UngdomsVasan(Children race) & KortVasan(Family race). Our family started under the good snow and course condition from Oxberg. Our family enjoyed 30km CT race so good ski condition. Then he got 5th stamp for WL silver Master. Thanks a lot for big contribution and many aid mails from all over the world for Japanese big disaster Earthquake, Tsunami & accident of Atomic power plant in Fukusima in 2011.3.11. We apologize for spreading pollution of radioactive substance from Fukusima, where situation is still dangerous now. We leave Japan soon for his 6th WL race in Austria, see you soon on the snow! !